When making the Pad Thai sauce it might seem that we are using a lot of honey, but you need it to balance out the sourness of the tamarind - this balance is what makes Pad Thai taste so amazing! Cook the noodles as per pack instructions, then remove from the heat and drain and rinse in cold water, set aside. To make the Pad Thai Sauce, combine all the ingredients together in a small bowl. In a separate bowl combine the cornflour and soy sauce then place the chicken into the bowl and stir to ensure the chicken is coated. Drizzle a little oil in a Wok or large frying pan. Add the garlic and chilli and cook for 30 seconds, then add the coated chicken. When all the liquid has evaporated add the chicken stock, a little at a time. 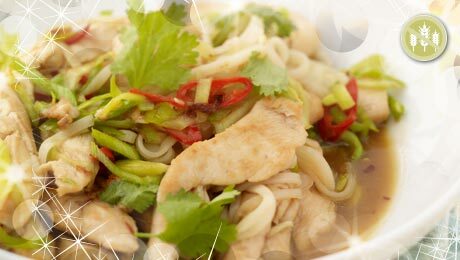 Toss in the noodles and stir fry until the chicken has cooked through (approximately 6-7 minutes). Pour in the Pad Thai sauce and gentle lift and turn the noodles. Stir fry for a further 1-2 mins. Taste test for seasoning and add a further splash of fish sauce if desired. Lift noodles onto a serving plate. Top with generous amounts of fresh coriander, spring onion, and crushed/chopped nuts. Add fresh lime wedges to squeeze over each portion.